There’s something undeniably fascinating about seeing what kind of music celebrities listen to. Occasionally, it reveals something about their personality that you wouldn’t have guessed, like when Brian Williams revealed himself to be a massive Deer Tick fan, exposing his late-night listening habits in the process. Other times, however, it’s delightfully on the nose, with the person professing a fondness for artists or genres you could’ve seen coming a mile away. 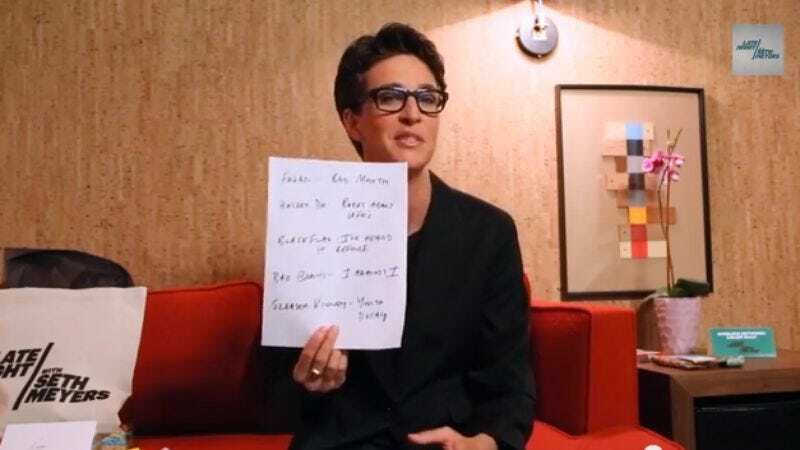 Such is the case with MSNBC host Rachel Maddow, who was asked during a visit to Late Night With Seth Meyers to compile a list of “angry punk songs to get you through the midterms” (elections, that is, not college exams), and was only too happy to comply. The resulting video demonstrates a true fondness for each artist selected, along with Maddow offering up extensive, politically relevant explanations for why she chose each song. While the video doesn’t actually let you hear any of the songs, we’ve helpfully included all five of them below, in the order she discusses them. She also very sweetly warns viewers that the Black Flag song “has a lot of swears, right up front,” which is an incredibly endearing warning to place in the middle of your list of angry punk rock songs.